Cut a fresh lime lengthwise. Split each half again. Using only three wedges (3/4 of the lime) cute the wedges in half again. Using a pestle smash the lime and add the suagr cane sugar. Remember that the lime has to be smashed only moments before preparing the Caipirinha. 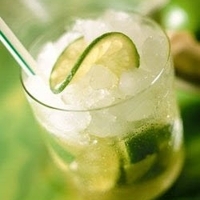 Fill the glass with ice cubes (Useing crushed ice will make the drink watery) and pour in the cachaca. Shake it well with a shaker and pour back into the glass. Garnish it and serve immediately. Looks good.. refreshing id say... I could try this, summer out here.